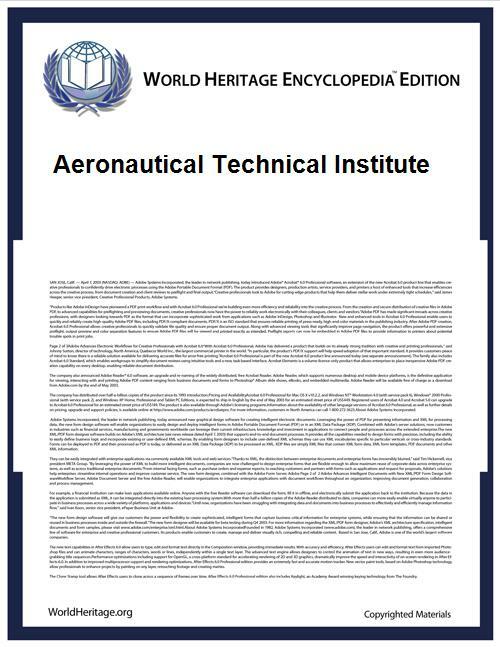 Aeronautical Technical Institute (ATI), (Serbian: Vazduhoplovno-tehnički institut, VTI) was a Yugoslav design bureau for designing military aircraft. It existed from 1946 to 1992, and was located in Žarkovo, near Belgrade. After the dissolution of Yugoslavia and the JNA, the institute was merged into the MTI - Military Technical Institute Belgrade (Serbian: VTI - Vojnotehnički Institut Beograd). Airplanes designed by the institute include the J-20 Kraguj, the G-2 Galeb, the G-4 Super Galeb, the J-22 Orao and the Novi Avion. Currently active aircraft programs are Lasta 95 trainer and Kobac counter-insurgency aircraft. Aircraft designed by VTI were produced by manufacturers such as SOKO (Mostar) and UTVA (Pančevo). Trisonic wind tunnel T-38. Developed and built in cooperation with companies from Canada and USA. Purposely built to support development of Novi Avion, missiles and other similar advanced programs.